George Allen, Sr. was born in Nelson County, Virginia, USA. 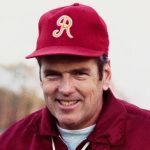 He was an American football coach in the National Football League and the United States Football League. He was inducted into the Virginia Sports Hall of Fame in 1998 and the Pro Football Hall of Fame in 2002. He graduated with a B.S. in education from Michigan State Normal College in Ypsilanti. In 1947, he earned his master's degree in physical education from the University of Michigan, Ann Arbor.